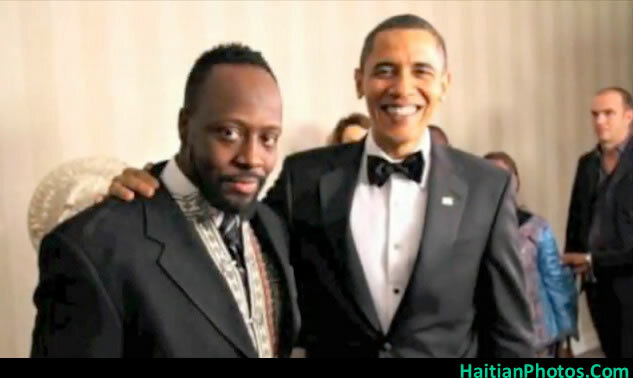 Here is a picture of President Barack Obama and Haitian star Wyclef Jean. Wyclef Jean is a Haitian rapper, musician and actor. In the elections of 28 November 2010, he had an intention for the presidency of Haiti. 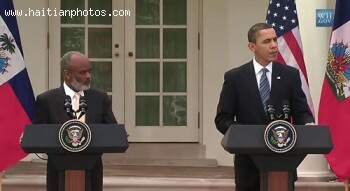 After registering as a candidate, he told his enthusiastic supporters: I want to be Barack Obama of Haiti. He told that he will take his countrymen to a state that is righteous, to a golden era of prosperity. He is a Haitian in the truest form, he will speak in a language that 90% Haitians understand (Haiti, Wyclef Jean & The Scavengers). Since he spent only five years of his life in Haiti, his candidacy was rejected. In an August 2014, Democratic National Convention, Wyclef performed with many other celebrities of Tinseltown. He recorded a video on Barack Obama. 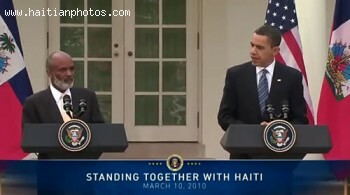 After the 2010 earthquake, to support Haitian relief, he requested Barack Obama to declare a state of emergency. Here is the first Lady of the United States, Michelle Obama, viewing the devastation in Port-au-Prince after the 2010 Haiti Earthquake. She stated that it was really moving to see the devastation. She also visited a bus where the children were involved in art therapy. Here is a picture of First Lady Michelle Obama accompanied with a security personnel as she arrived in Haiti three months after the earthquake. She was in Haiti with Jill Biden. Here is a picture of the U.S. 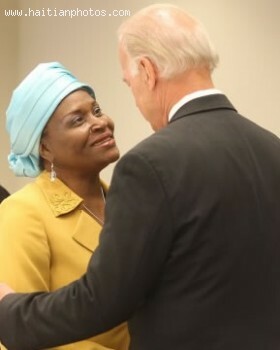 Vice-President Joe Biden greeting Haitian activist Marleine Bastien during his visit to Little Haiti following the earthquake. Here is a picture of the First Lady Michelle Obama as she was accompanied by the Haitian President Rene Preval on her one day visit to Haiti. Michelle was in Haiti to visit the sites affected by the earthquake. 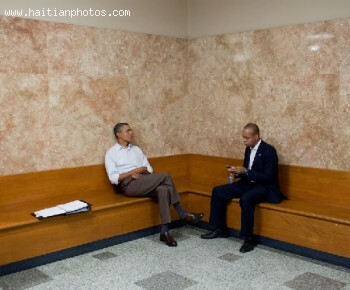 Here is a picture of the Haitian-American Patrick Gaspard in a conference with the most powerful man in the world, Mr. Barack Obama. Do you know that he actually was not born in Haiti. Like in the case of many Haitians families, he was born in the Democratic Republic of Congo but is 100 percent Haitian. Both of his parents are Haitians.